A job fair for veterans will be held at Chicago's Union Station on Tuesday. 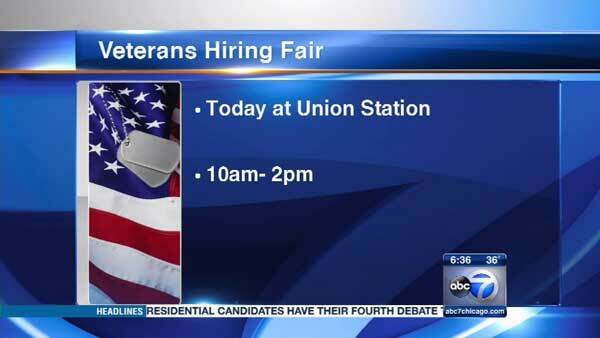 CHICAGO (WLS) -- A job fair for veterans will be held at Chicago's Union Station on Tuesday. CareerBuilder and Fifth Third Bank are hosting the job fair from 10 a.m. - 2 p.m. in the Great Hall at 500 West Jackson Boulevard in Chicago. To register for the job fair, CLICK HERE. Organizers said more than 30 local companies are looking to hire new employees, including Fifth Third, Metra, CTA, Loretto Hospital, University of Chicago Medicine, Orion Energy Systems and Potbelly. Job hopefuls can have professional headshots taken and have financial consultations done for free at the job fair. They can also attend a free workshop by international speaker and trainer Sima Dahl on "how to leverage LinkedIn for your job search." For more information, call (312) 704-4179. For advice on how to make the most of the job fair for veterans, check out this article from CareerBuilder. A veterans appreciation rally will follow the job fair. Jim Cornelison of the Chicago Blackhawks will sing the national anthem to kick off the event at 2 p.m.
A separate job fair for veterans will be held at Triton College in northwest suburban River Grove from 11 a.m. - 3 p.m. Tuesday. The event will be held at the Student Center cafeteria in Building B at 2000 5th Avenue.